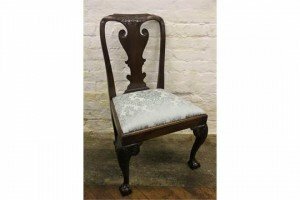 A George II carved walnut chair, possibly Irish, solid splat with scroll detailing above a foliate upholstered drop in seat, on shell carved cabriole legs and claw and ball feet. 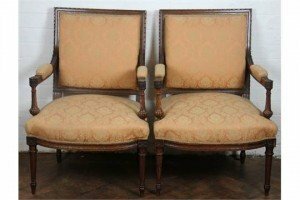 A pair of 19th century Louis XV design walnut fauteuil, with carved ribbon twist square backs, reeded and spiral fluted arms with flower head terminals, on fluted and tapered legs. 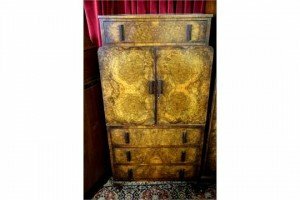 An Art Deco burr walnut bedroom cabinet, with drawer above two cupboard doors, over three further drawers, on cabriole legs. 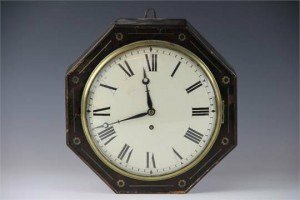 An early 19th century mahogany wall clock, with enamel dial with Roman numerals and single fusee movement, in a hexagonal case with inlaid brass detailing. 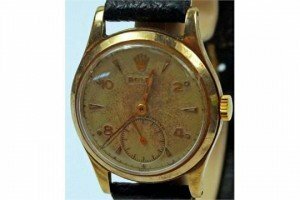 A 1950’s 9ct gold Rolex gentleman’s wristwatch, with matt cream dial, Arabic numerals and triangular markers with minute track having second subsidiary dial to 6 o’clock with gilt arrow hands, on later strap with additional Rolex yellow metal buckle marked 9ct. 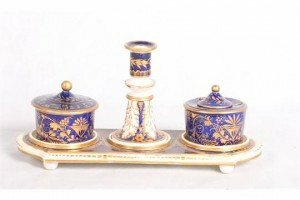 A Stevenson & Hancock Derby porcelain inkstand fitted inkwell, wafer box and taper stick, decorated flowers in gilt on a dark blue ground. 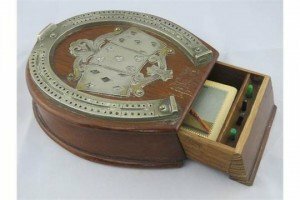 A vintage horse shoe games box, featuring plated applied decoration in the form of playing cards and a horse shoe shaped cribbage board, all on an oak frame. Having pull out draw containing vintage playing cards within. 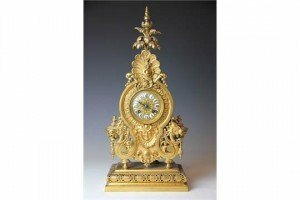 A 19th century French gilt brass eight day mantel clock, enamel Roman numerals and movement striking on a gong, the case with foliate plume and cast with a peacock, dragons, a mash and scrolls, on rectangular base. 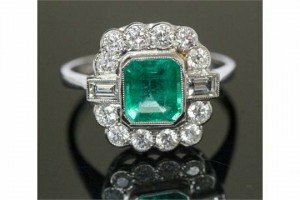 An emerald and diamond cluster white gold ring, the central emerald weighing approximately 1.25 ct, the diamond cluster surround comprising twelve round brilliant cut diamond and two baguette cut diamonds, a total diamond weight of approximately 0.88 ct, 18ct white gold. 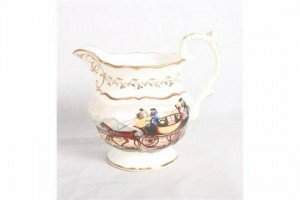 A late 18th Century Staffordshire porcelain jug decorated with a London mail coach to one side and “James Danson Born the 15th Janry 1798” to the other, with moulded and gilt border. 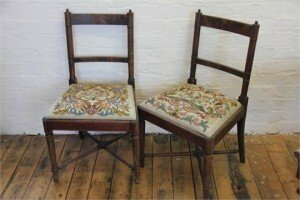 A pair of Regency mahogany side chairs, with turned uprights and gross and petit point needlework seats on tapered legs. 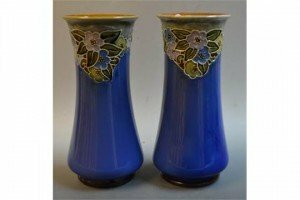 A pair of Royal Doulton waisted cylindrical vases, tube lined with flowers and leaves on a blue ground. 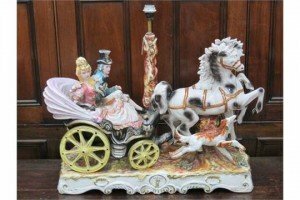 A 20th century, large hand painted, ceramic Capodemonti style lamp base, depicting a 19th century carriage group. 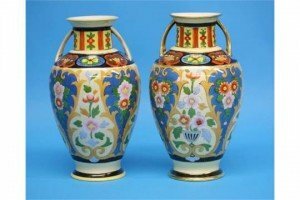 A pair of Noritake vases with gilt looped handles decorated with colourful flowers on a yellow and blue ground. 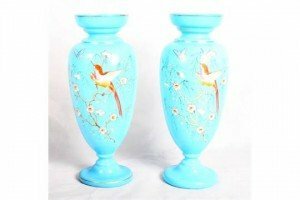 A pair of Victorian oviform blue glass vases with enamelled decoration of bird, butterfly and flowering bush. 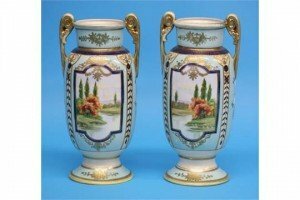 A pair of Noritake vases with gilt acanthus scrolled handles, each decorated with landscaped panels on a turquoise ground. 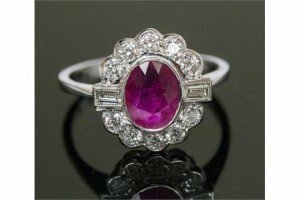 A ruby and diamond cluster ring, the central oval mixed cut ruby weighing approximately 0.65ct, the twelve round brilliant cut diamonds and two baguette cut diamonds weighing a total of approximately 1.25ct. 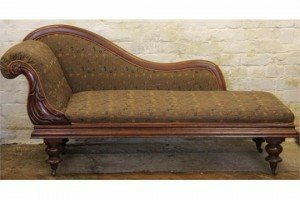 A Victorian carved mahogany chaise lounge chair with a scroll back and floral upholstery, on turned legs with fitted caters. 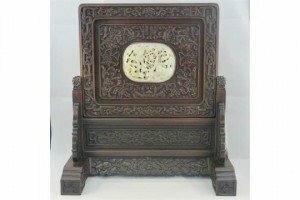 An early 20th century free standing blind carved Oriental hardwood two sectional table screen. Having relief decoration throughout with central pierced and carved mutton fat jade large cabochon depicting a hunter and lion. 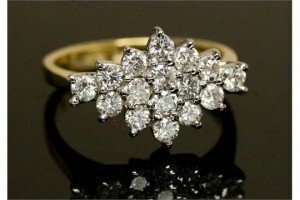 A diamond cluster ring in lozenge shaped mount, claw set border of twelve brilliant cut diamonds, each approximately 0.05ct and four central diamonds each of approximately 0.07ct, 18ct gold.